Home > General News > What is Hemlock Woolly Adelgid? Hemlock Woolly Adelgid, scientifically known as Adelges tsugae, is a sap-feeding insect that infests hemlock trees. It is a native of Asia and was introduced into Pacific Northwest in 1924. Since then, this insect has been traveling to new destinations and, as of now, it has become a major threat to eastern hemlock and Carolina hemlock forests in the United States. adelgid from enemies. It also prevents the eggs from drying out. The enclosures, also known as ovisacs, are found clinging to the underside of the hemlock tree branches. The overwintering adults are black, oval, and approximately 2 mm long. The woolly cotton balls are the first signs of adelgid infestation. They are usually found all round the year but their presence is more abundant and conspicuous during late fall to early summer. The ovisacs keep clinging on the underside of hemlock branch tips even after the insects are dead. This insect is parthenogenetic i.e. all individuals are female and they reproduce asexually. Adelgids undergo six different stages of development; egg, four nymphal stages, and an adult stage. Hemlock Woolly Adelgids have two generations per year i.e. the winter generation and the spring generation. The winter generation is called sistens. Their life cycle lasts from early summer to spring of the following year (i.e. June to March of the following year). The summer generation is called progrediens. Their lifecycle is from spring to summer of the same year (i.e. March to June). 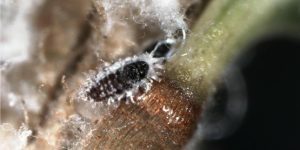 During March, the overwintering female adelgid lays up to 300 eggs within the protective cottony filaments that they create. The eggs start hatching in April and the crawlers (i.e. the first nymphal stage) come out of the protective layer to settle on the twigs, near the base of the needles. Some of the crawlers are carried away to their new host through the wind and other insects. Once they have settled, they start feeding on the sap of the hemlock tree. The crawlers undergo three more nymphal stages and become mature females by June. Once they are fully grown, they start depositing eggs. The summer generation deposits about 75 eggs each. The crawlers start hatching in July and, once they are settled on their new host, they become dormant. The dormancy lasts from August to mid-October. By end of October, the nymphs resume feeding and continue to develop throughout winter. Hemlock woolly adelgid is known for its unusual habit of going into a period of dormancy during summer instead of winter. Hemlock Woolly Adelgid is a destructive pest in North America. It has severely affected the eastern hemlock and the Carolina hemlock. It was accidentally introduced to North America from Asia in the early 1950s. Since then, it has become a widespread pest in Oregon, California, Rhode Island, West Virginia, Virginia, Delaware, Kentucky, North and South Carolina, New York, Maryland, Pennsylvania, Connecticut, New Jersey, and many other states. The eggs sacs that resemble small tufts of cotton are the most obvious signs of hemlock woolly adelgid infestation. They are usually found clinging to the underside of hemlock branches. The cottony filaments are found all round the year but they are most prominent during spring. They are protective masses that keep expanding in size to accommodate the growing nymphs inside. Adelgid infested hemlock often appear greyish-green instead of dark green. 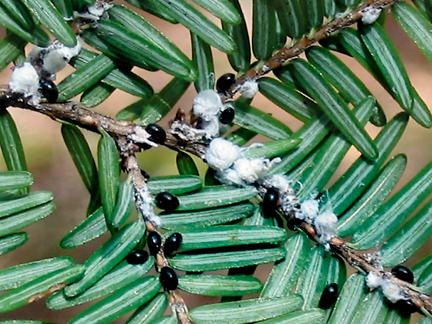 Hemlock woolly adelgid can severely affect the growth and mortality of hemlock trees. The nymphs feed on the sap of the trees, thereby depriving them of the basic nutrients that they need to survive. Severe infestation can cause premature needle drop, reduced growth of trees, and dieback of branches. Most trees can survive moderate infestation for a few years but, they may die due to secondary causes. The weak hemlock trees are more susceptible to breakage, infection, and diseases and therefore, they should be treated for this pest before they succumb to the infestation. Adelgid infestation, when detected in early stages, can be controlled easily. If you see cottony filaments under the leaves of your hemlock tree, contact your nearby pest control company for a thorough evaluation.